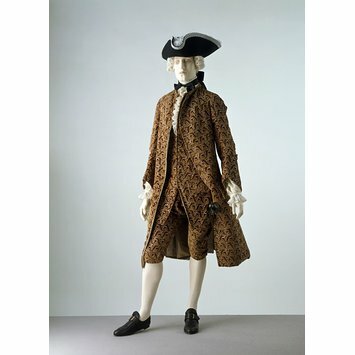 This formal man’s suit of about 1760 is made from cut and uncut yellow and purple silk velvet with a ground enriched with silver strip. The fabric was probably made in France. Such a luxurious material would have been worn for the most formal evening occasions, for example visiting the theatre or the opera. As with all formal men’s wear, it was worn with lace ruffles at the wrists and throat. By 1760 the fronts of the coat are starting to curve back. The side pleats are less voluminous than they were earlier in the century. The waistcoat has shortened to mid-thigh length. 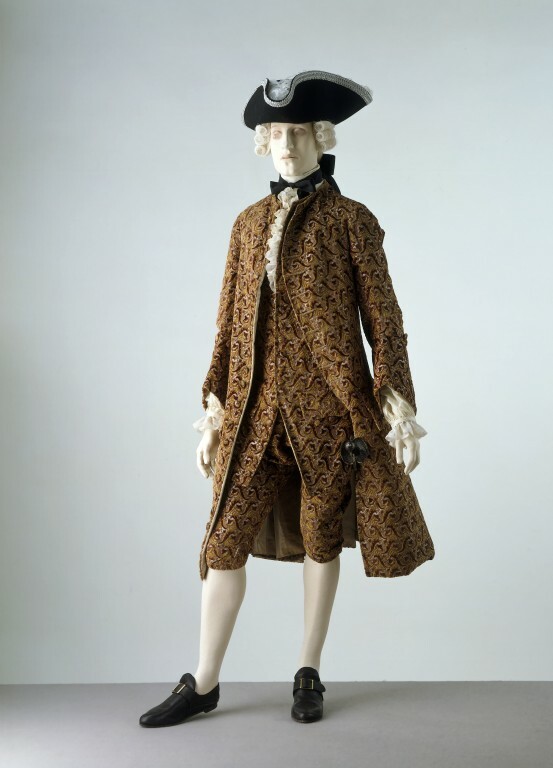 A man's coat, waistcoat and breeches of silk velvet. The pattern of diagonal scrolls is made of areas of maroon cut velvet, pink uncut velvet, cut and uncut yellow velvet, with a voided ground of white silk with silver strip. The coat has a round neckline, bound with a narrow strip of velvet. The shaped, two-piece sleeves are slightly loose and end above the wrists with a deep round cuff (17.5 cm at top, 20.5 cm at bottom). The fronts curve from neck to hem with wide skirts below the hip, set in two pleats (17.5 cm) either side of the side openings. There is an inverted pleat either side of the opening at centre back. There is a scalloped pocket flap on each coat front at hip level. The pockets are lined with bleached linen. The front edges, cuffs, pocket flaps and front skirts are interlined. There are 20 velvet-covered buttons on the right front, from neck to hem, but only 11 buttonholes on the left front, from neck to the pocket flap. There are 5 buttons below each pocket flap, one on each side above the pleats, and 5 at the top edge of each cuff. The waistcoat fronts and back skirts are made of the silk velvet, the backs of beige wool broacloth. The neckline is round and bound with a narrow strip of velvet. The fronts curve from waist to hem with wide skirts below the hem, reaching to mid-thigh. There is a scalloped pocket flap on each waistcoat front at hip level. The pockets and waistcoat torso are lined with fustian; the pocket flaps with ivory silk satin, the front edges faced with the satin. The front edges are interlined. There are 20 small, velvet-covered buttons on the right front, from neck to hem, but only 14 buttonholes on the left front, from neck to pocket flap. The breeches are made of the silk velvet and cut in two fronts, two, pieced backs and a two-piece waistband. The back is higher than thefront, with the fullness gathered into the waistbands. The breeches have a fall front, with a pocket and pocket flap on each side, a watch pocket in the front of the right waistband, and a pocket in the right side seam. The pockets and waistbands are lined with fustian, the fall front with ivory silk satin. The legs are unlined and the seams bound with coarse, unbleached linen tape. The waistbands are interlined with buckram. There are 3 large velvet-covered button (2 now missing) and buttonholes fastening the waistbands, one small button for the pocket flaps and 4 on the outside of each leg. Buckle bands secure the bottom of the legs. The lining of the coat and waistcoat skirts had been covered over or replaced with cream silk satin, probably in the 19th century. The breeches have been altered either for fancy dress or display. The waistband linings were removed. A piece of maroon velvet has been sewn to the right front waistband and one of the buttons sewn to it to enlarge the waist. An additional waistband of cream wool flannel has been added above the waistbands, with cotton-covered wooden buttons at the front and top edges for braces.